Heidi Sowatsky, owner, designer and St. Louis-area regional manager at Decorating Den, talks designing with Decorating Den. Designer Heidi Sowatsky purchased her franchise of Decorating Den 11 years ago. In addition to creating beautiful designs for her clients, she is also the St. Louis-area regional manager for Decorating Den. 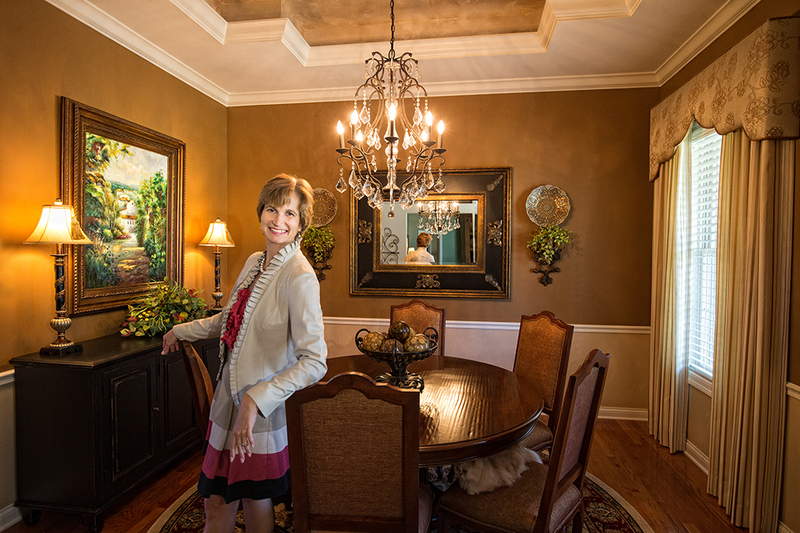 Over the years, Heidi has won several design and sales awards. SLHL: How do you go about becoming a Decorating Den designer? Heidi: Decorating Den offers opportunities as both franchise owners and decorators. The primary difference is whether or not you want to own your own design business with a network of support or if you prefer to work for someone else. We look first for a passion and talent for design and a motivation to succeed. We can teach much of the rest. SLHL: Tell us how being a Decorating Den designer is different than designing for other firms. Heidi: We come to you with a complimentary initial design consultation. Design decisions can be made in the client’s home without running all over town. Decorating Den generally does not have an hourly design fee. We are able to negotiate discounts from vendors that allow us to find design solutions for our clients at regular retail prices without adding on additional fees. This is attractive to our clients because they know exactly how much they are spending with no surprise invoices. SLHL: Who would be a great candidate to become a Decorating Den designer? Heidi: The typical Decorating Den designer likes to work for herself, but not by herself. She or he is both creative and motivated; a multi-tasker who can empathize with the client to solve the decorating problem. SLHL: As a Decorating Den designer, are you required to purchase furnishings and accessories through Decorating Den? SLHL: Is there any specialized training offered by Decorating Den? Heidi: Training is offered in almost every area needed to run your own business. We take the basic design competencies and add to that the practical skills, like designing window treatments, purchase order management, marketing, business planning. Training starts with intensive classes at the headquarters and continues with proprietary webinars, classes at annual conference and monthly regional meetings. In addition, there is a tremendous culture of sharing among the franchise owners. We learn from each other's challenges and successes. Heidi: Designing a room is all about bringing design principles to what the client wants to accomplish. We believe it's all about you… your style, your budget and our expertise!